Wood Selections are made for purpose, color, consistency, and quality from a wide variety of Veneer and solid cut wood to make the parts for our cabinetry. No two pieces of wood, whether cut from the same tree or two different trees, are exactly alike. Variation in weather and soil conditions will cause different growth rates, color, and grain features. At Smart Cabinetry, we mainly use three species of wood: Oak, Maple, and Cherry. Natural oak colors range from light tans to deep reddish browns. Streaks of yellow or black mineral deposits. Noticeable differences in color between open and close-grained areas which may be more evident with light colored stain. Variations in color can occur within a single door. Cherry varies from rich red to reddish brown and will darken on exposure to light. In contrast the sapwood is creamy white. The wood has a fine uniform straight grain, smooth texture, and may naturally contain brown pith flecks and small gum pockets. Rich red to reddish brown. Will darken on exposure to light. May naturally contain brown pith flecks and small gum pockets. The sapwood of Maple is creamy white with a slight reddish brown tinge and the heartwood varies from light to dark reddish brown. The wood is usually straight grained but it can also occur as ‘curly’, and ‘fiddleback’ figure. Creamy white to light blonde tones to dark reddish brown tones. Sugar streaks of carmel of dark brown in nature that darken with stain. Small mineral streaks of light blonde or reddish brown that darken with stain. Wavy, curly bird's-eye or burl graining as well as "worm tracks" across the grain that will darken when stained. Variations in color can occur within a single door, drawer front, and face frame. A wood product in which thin sheets of wood are glued together, grains of adjacent sheets being at right angles to each other in the principal plane. Because of this cross-grained orientation, mechanical properties are less directional than those of natural lumber and more dimensionally stable. Tree farms are now cultivated specifically to yield logs suitable for processing into sheets for plywood. 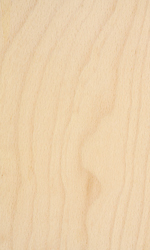 Most commonly used plywoods are 1/4" (0.6cm) sanded interior paneling or 1/2" (1.3cm) exterior grade plywood sheeting. Other standard thicknesses extend to 1" (2.5cm) for interior types and to 1-1/8" (2.8cm) for exterior types. The most common panel size is 4' × 8' (1.2m × 2.4m); larger sizes are manufactured for such special purposes as boat hulls. Finished plywood may be un-sanded, sanded, or overlayed with several types of coatings for decorative and specialty uses. Plywood in appropriate grades is used in many different applications, such as furniture, wall facings, shelving, containers, crates, fences, forms, sub flooring, and roof decking. 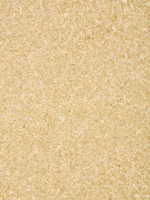 Particleboard is a composite panel product consisting of cellulose particles of various sizes that are bonded together with a synthetic resin or binder under heat and pressure. Particle geometry, resin levels, board density, and manufacturing processes may be modified to produce products suitable for specific end uses. Today’s particleboard gives industrial users the consistent quality and design flexibility needed for fast, efficient production lines and quality consumer products. 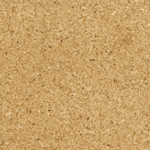 Particleboard panels are manufactured in a variety of dimensions and densities, providing the opportunity to design the end product with the specific particleboard needed. Medium Density Fiberboard (MDF) is a composite panel product consisting of cellulose fibers combined with a synthetic resin or other suitable bonding system and joined together under heat and pressure. Additives may be introduced during manufacturing to impart additional characteristics. The surface of MDF is flat, smooth, uniform, dense and free of knots and grain patterns, all of which make finishing operations easier and more consistent, especially for demanding uses such as direct printing and thin laminates. The homogeneous density profile of MDF allows intricate and precise machining and finishing techniques for superior finished products. Trim waste is significantly reduced when using MDF compared to other substrates. Stability and strength are important assets of MDF, and it holds precise tolerances in accurately cut parts.